I’ve wanted to write this post for a long time. Every time I would go to write it, I would stop. It seemed too difficult to tell the story well. To tell the story of forgiveness. I hope I serve the art of forgiving well as I share my heart today. I believe the process of forgiveness looks different according to each situation. Many times it’s easy. It’s easy to forgive your children for forgetting to clean their room. It’s easy to forgive your spouse when he doesn’t meet an expectation. It’s easy, or it should be easy, to forgive a friend when they disappoint you. Why? Because, we are making allowances for each other’s faults. So, immediate forgiveness makes sense. The process is hardly a process at all. But deep hurts of betrayal or of life-changing wrong-doing require a process of forgiveness. I don’t know that I truly understood this until last year when my family was forced to walk through it. Even the process of forgiving John Henry’s dad was easier. As crazy as it sounds, that hurt was not a hurt that was meant to deliberately hurt me or him. While it affected us, it wasn’t about us. It was about him. I know this is a hard pill for some to swallow who have experienced their spouse leaving them. But, because of the love I had for both of them and the awareness that it wasn’t about me, walking in forgiveness was an easy process. It didn’t make the hurt any less. I still had to live with the decision. But, it did make releasing any anger and resentment possible and quick. Am I making sense? See the difference? The hurt stayed a while, but the resentment did not. Last year, I experienced a different kind of hurt. The kind that affects your entire family. The kind where intentions just don’t seem right. The kind where you have no emotional ties to the instigators, so there seems to be no reason to “let them off the hook.” I was hurt. I felt violated, betrayed, angry, resentful. Where was the justice, the fairness, the accountability? Every feeling was necessary for me to feel. The hard part in it all was trying not to lose who I was in it. Trying not to forget who HE was in me. Who HE is in each of us. I wanted to forgive. I would pray and release them, but I would find myself meeting that anger again whenever I allowed my mind to go there. Forgiveness was going to be hard. I was initially hard on myself, because, I felt like I knew better. I knew it was necessary. But, I never understood the process of this kind of hurt until I had to walk through it. So, I learned that sometimes forgiveness is a journey. But, it has to be an intentional journey. It has to be so intentional that you set out every day with the goal of releasing it. You set your heart on the mission of letting them off the hook. It did not happen with a prayer. It didn’t happen with a single decision. It happened with multiple decisions. It happened with the realization that sometimes forgiveness is a process. It’s a decision you have to make over and over and over. Every single day. Until the hurt is gone. It’s deliberate. It’s a daily choice. And, it’s a process. Eventually, I framed my world to release the hurt and forgiveness so many times that it finally happened. I was free. And, so were the ones who hurt me. Don’t stay in deep-rooted hurt. Don’t accept that your hurt will always be there. Take the journey. Go through the process. Keep making the choice to forgive over and over until that hurt no longer carries any weight. Besides learning that sometimes forgiveness is a process, I also learned how little other hurts really are. I learned, that at the end of the day, it should be so easy to allow those we love to fail us. To let go of little things like someone not meeting your expectations. It became so easy to always fill in the gap of my expectations and disappointments with love and forgiveness. Everything else became so small. The people in my life became so big….as did my love for them. The decisions we made after our big hurt made our lives richer. Better. Nothing went to waste, and God has used it ALL for our good. If you’re holding onto hurt, choose to go through the process of forgiveness. Allow God to work even that for your good. He loves you, and His ways are so, so good. So worth it. YOU are worth it. Well, because, what if He doesn’t want what I want? For real. So, to play it safe, I steer clear of surrendering a thing or two. But, that’s not playing it safe. I want whatever You want for me. Wherever you want me to be. Whatever you want me to do. THAT’S what I want. His ways are higher than our ways. He even loves me more than my mama. And, that’s sayin’ a lot, folks. When is the last time you told Him you want whatever He wants? And meant it? I have lived with my husband’s problem for more than five years now. I’ve encouraged him to seek counseling, but he is convinced that he does not have a problem. “It’s been a part of me since I was seventeen. I can’t let go of it.” Kris has explained over and over. For the longest time, I tried to deny it was there. I buried my head into the other parts of the garage where I wouldn’t be able to see it. But, I know it’s there. He knows it’s there. And, I’m currently reconciling the fact that it will always be a part of him. So, it will always be a part of me. Unless, the Holy Spirit convicts him otherwise. Until then, this will be in my garage. I’ve learned to live with it. He’s not ready to deal with the issue. And, I am going to love him through it. ‘Cause that’s what a good wife does. 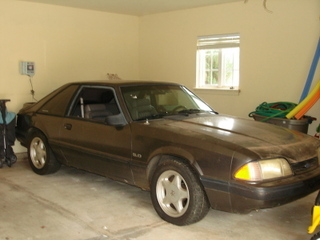 I cannot tell you the last time this 1991 Ford Mustang had a bath, was taken for a drive, or was just simply sat in. But, it (she) is a part of us. And, he can’t let her go. So often we hold onto things that keep us from moving forward in Christ. We develop unhealthy attachments to things, addictions, even people. I’m not talking about your high school car or your 8-track collection. I’m talking about those things that are hindrances to your relationship with Christ and His call on your life. Philippians 3:13-14 says 13 No, dear brothers and sisters, I have not achieved it, but I focus on this one thing: Forgetting the past and looking forward to what lies ahead, 14 I press on to reach the end of the race and receive the heavenly prize for which God, through Christ Jesus, is calling us. Are you holding onto to something that is hindering your growth in Christ? Or, do you own something that you could never part with? Like your first Swatch watch or Members Only jacket?